Harpy eagles are said to be the largest and most powerful of the eagles. They are found in lowland tropical rainforests from southern Mexico to northern Argentina. Adults can reach up to 3.5 feet long and can weigh up to 20 lb. Their wingspans can reach as high as 6.5 feet. Females are larger and heavier than males. Their plumage is dark gray and white in front. The head is a lighter shade of gray and both the male and female develop a crest of long feathers. 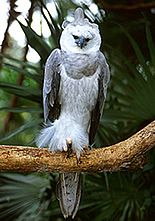 The harpy eagle prefers large, uninterrupted forest habitat. Also, open patches of forest must be nearby for hunting. They feed mainly on tree-dwelling animals such as sloths, monkeys, opossums, and some reptiles and other birds. Prey is caught by flying through the trees with a quick and hard strike. The eagles build large nests using sticks and branches in trees as tall as possible. Females lay one or two eggs and usually only one may survive and hatch around 50 days later. The chick remains dependent on the parents for one year. 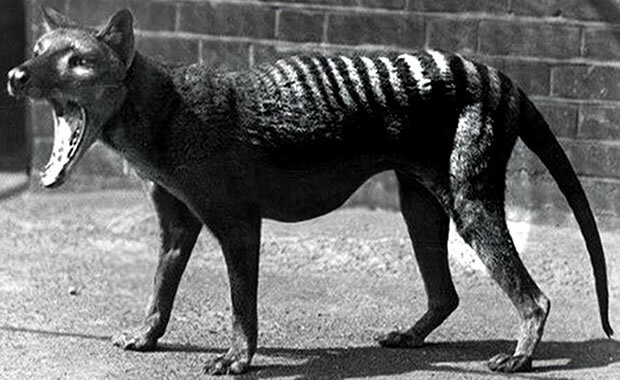 The main threat to the species is hunting and loss of habitat due to logging and rainforest depletion. The Harpy Eagle Conservation Program currently works with South American governments, logging companies, and locals to protect nesting sites. Copyright Notice: This article is licensed under the GNU Free Documentation License. It uses material from the Wikipedia article "Harpy eagle". Glenn, C. R. 2006. "Earth's Endangered Creatures - Harpy Eagle Facts" (Online). Accessed 4/23/2019 at http://earthsendangered.com/profile.asp?sp=136&ID=9. Need more Harpy Eagle facts?